It goes without saying that blogs are a diary and the writer moves on as they write. For some reason I'm interested in learning how to make things. 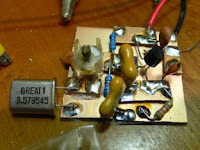 Tonight I re-made a crystal oscillator built a few days ago, as you see it's more compact and professional looking. (They both work by the way).